Documentation: Photograph: 19 Dec 2003 Keystone Lake, Keith Co (Brogie 2005, Dinsmore 2000). Records: The only records are likely referable to the same individual, a male that wintered on Keystone Lake for five winters, beginning 3 Dec 1999-29 Apr 2000 (Dinsmore 2000, Jorgensen 2001). Subsequent sightings were 26 Nov-13 Dec 2000 (Jorgensen 2002), 16 Dec 2001 and 19 Jan 2002, 15 Dec 2002, 14-16 May 2003, and 19-22 Dec 2003. Comments: This Palearctic species occurs rarely but with some regularity along both the Pacific and Atlantic Coasts, south to about southern California and New Jersey, respectively (AOU 1998). It is very rare in the western interior United States (Toochin 1998). The only records from states neighboring Nebraska are from Wyoming 10 Apr 1966, 11 Mar 1994, and 1 Apr 1999 (Faulkner 2010), Colorado 21-23 Mar 1997, 28 Mar 2000, 21 Jun 2007, 17 Jan 2011, and 4 Dec 2011 (CBRC, eBird.org, accessed November 2017), and Kansas 27 Oct 1996 (Thompson et al 2011). Hybrids, with scaup or Ring-necked Duck, are reported also; one was at Denver, Colorado, 22-26 Apr 1997 (Brandon Percival, pers. comm.). 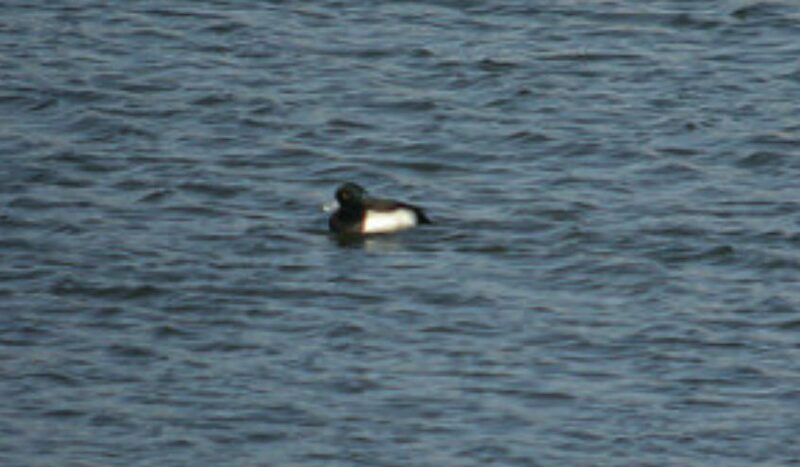 Photograph (top) of a Tufted Duck at Lake Ogallala, Keith Co 14 Jan 2004 by Marshall Iliff. CBRC [Colorado Bird Records Committee]. 2017. Tufted Duck records. Colorado Bird Records Committee database, accessed November 2017. Dinsmore, S.J. 2000. Tufted Duck at Lake Ogallala: first record for Nebraska. NBR 66: 102-103. Toochin, M. 1998. Possible anywhere: Tufted Duck. Birding 30: 370-383.